FREE! Hear from an exciting array of artists from the exhibition. Panelists: Bob Nakamura, Nancy Uemura, Linda Nishio, and Nobuko Miyamoto. Oxnard Madame (1961), Matsumi “Mike” Kanemitsu. 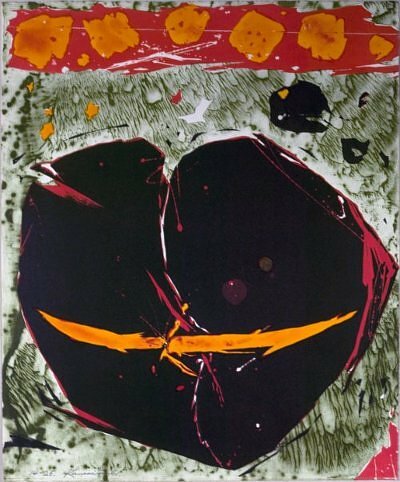 This lithograph, created during a residency at Tamarind Workshop, was inspired by a story Kanemitsu heard on a drive up the coast toward Santa Barbara about a madame who ran a prostitution ring in Oxnard. The madame, who was African American, was extremely successful and connected but was ultimately arrested. At the time of the arrest, it was discovered that she was a man and had been living as a transvestite for over thirty years. Kanemitsu was intrigued by the idea of this seemingly marginal figure having such power in the community and ultimately upending social conventions in so many different ways. Using this amazing anecdote as a springboard for vaguely anatomical abstractions, Kanemitsu explores the medium of lithography with an ease that comes from his mastery of Japanese sumi ink painting and his embrace of bold, graphic color. Lithography (paper and ink) 15 x 18 in. Gift of Margot H. Leavin, Japanese American National Museum (99.288.2). A survey of the dynamic and diverse Japanese American contributions to the visual landscape of L.A. in the period following World War II. Works of art and historic documents—together with texts, images, and video clips from extensive oral histories—will illustrate the delicate line that exists between form and function. Drawing the Line is part of Pacific Standard Time. This unprecedented collaboration, initiated by the Getty, brings together more than sixty cultural institutions from across Southern California for six months beginning October 2011 to tell the story of the birth of the L.A. art scene.